It’s not the type of information you’d ordinarily have. How do you know if your pregnancy is going well, or if your child is growing properly, or if you need medical assistance? Without the necessary support and access to clinics, pregnant women and new mothers in far-flung areas battle to receive information that may be the difference between stunting or normal growth, even life or death. Now an app seeks toÂ provide information and assistance toÂ all pregnant women in South Africa. It may be hard to believe, but maternal and infant mortality is still a huge issue in South Africa. In 2015, 41 out of 1000 children under five died, while 140 out of 100,000 mothers lostÂ their lives. To address this shocking scenario, the South African government launched an innovative app called MomConnect,Â designed to improve information to pregnant and new mothers across the country. As the logic goes: health infrastructure will take timeÂ to build, information in the digital age is far easier to arrange. The project is funded in part by US government, Johnson & Johnson and ELMA Philanthropies. The app connects pregnant women to the department of health – they receive SMSes that provide information on the stage of their pregnancy, reminders for appointments at the local clinic and when their babyÂ should be eating solids. Since it was launched in August 2014, more than 500,000 women have registered on the app, and 50% of all pregnant women in the country are currently on the network. But MOMConnectÂ goes one step further: it allows patients to rate the services at the clinics and hopes to build a digital registry of pregnant women. Peter Barron, with the Department of Health and from the School of Public Health at Wits University inÂ Johannesburg, spoke to The Daily Vox Â on the sidelines of the global maternity health conference in Mexico Â about the scope of the projectÂ and why it is being hailedÂ as a success story. MOMConnect is a messaging serviceÂ aimed pregnant women and their infants. It sends them SMS messages linked to the stage of pregnancy – that is how far they are in their pregnancy – and it gives themÂ specific messages about improving their health and what to do when they are faced with specific problems that they might experience during pregnancy. Why did the government choose to go down this route in tackling maternal health? a component aimed at the supply side and that includes receivingÂ complaints from pregnant women about the services they receive. Some of the complaints are linked to the long waiting times and theÂ attitudes of the nurses. We then give feedback to the management ofÂ the facilities where the complaints come from. How about the reach of the program? It is a national program. It reaches all parts of the country. And 95%Â of public health sector have got women who have registered toÂ MomConnect. So it is widely spread. We are now reaching around 40-50%Â of all pregnant women. We want to ratchet up to 70-80% – this is theÂ target for the second year of MomConnect. What sort of challenges have you faced thus far? One of the problems has been getting women registered. They have to doÂ it at the facility … and it takes long to register. We are looking at solutions to try find ways that make this process easier, with lessÂ reliance on connectivity and timeouts. We looking to use data orÂ batched registrations after hours. And success? How will we know if this has worked or not? Ultimately, meeting the goals of Sustainable Development Goals (SDGs)Â Â will matter the most … whether maternal and child mortality comesÂ down. But along the way, a number of process and outcome indicatorsÂ [like] the number of women attend antenatal clinics early on in theirÂ pregnancy. At the moment we have an indicator that tells us theÂ proportion of women that come before 20 weeks – and this number isÂ going up. Currently, we sitting at 55%. We would like to get it up toÂ 70%. This would be one of the kind of indicators that we would lookÂ at. How does the South African government guarantee that it’s sustainable andÂ not a gimmick? Because it is a high profile project, it is a ministerial project. ItÂ has the endorsement of the minister of Health, in making sure that itÂ gets the resources it needs. It is also embedded in the health systemÂ – it has a number of health system components to make sure that it isÂ not only just a messaging service for women, but also trying toÂ strengthen the health system as a whole.Â With the SDG’s, maternal and child health remains one of the keyÂ sustainable and development goals which the government has signed upÂ for, so there is no chance for the government not sustaining thisÂ program. This is how the app works:Â Dial *134*550# and register. 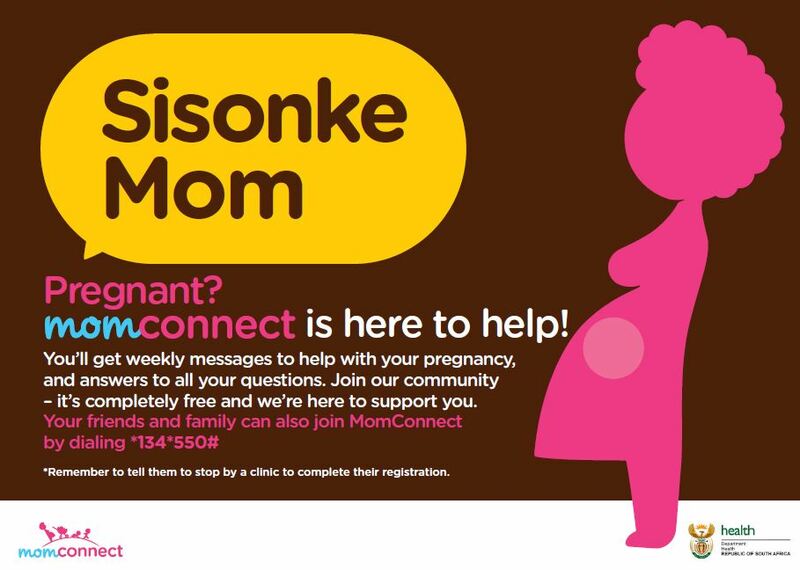 Once registered, pregnant mothers and new mothers are able to sendÂ SMSes free of charge to the ministry to either compliment or complainÂ about the service they received at clinics in South Africa. i am concern about too many messages about diseases that makes one worried about her status even when she went for the tests.all i have been getting from momconnect lately is about HIV and AIDS my partner thinks i am hiding something because of those messages. Please just one message about those kind of disease its fine. I’ve changed my number n those messages has been helping me a lot n my next date is 1st of next month, am so lost now can’t I be registered via phone or it’s a must of visit the clinic? I went for my first atenatal about a week ago and they registered my cellphone at the clinic and I did an hiv test and was negative but have received about hiv and how a lot of pregnant woman are living with the disease. I don’t think this service is accurate nor is it gonna be helpful during my pregnancy all it does is add stress to my life even took blood tests and nothing came back wrong. You guys must go back to the drawing board because how can you offer a service that’s supposed to help expectant mother but it’s not even accurate.